Often I find getting back on the bike hard after a long break. Not this time. 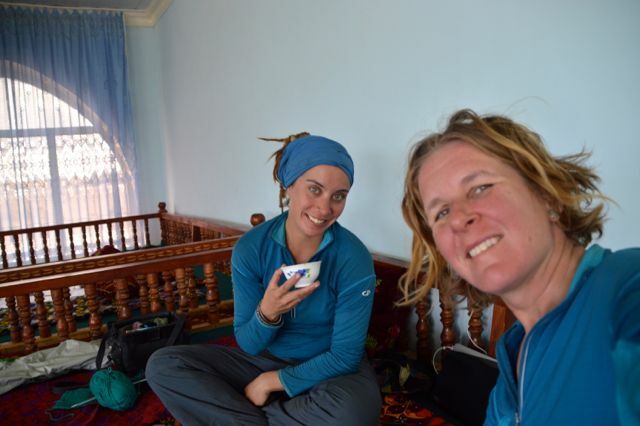 Aside from our 5 days across Uzbekistan we had barely pedaled since reaching Dushanbe. Both of us were ready for the adventures ahead, excited about Turkmenistan and more importantly, The Islamic Republic of Iran. 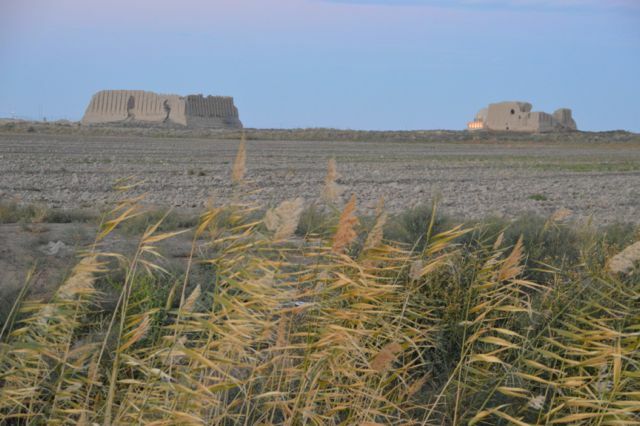 Our cycle out of Bukhara saw us pass many more cotton fields, and although the landscape was uninspiring, it was brilliant to be cycling again. 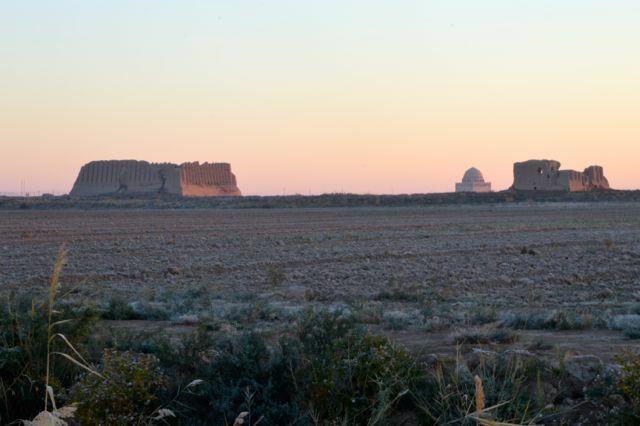 We had planned to camp near the border as our Turkmen transit visa started the following day. Stopping at a house about 20km before the border to collect water, we were invited in for tea. We accepted and then the family insisted we stay the night. As it was getting dark and we were not really that far from the border, we agreed with the plan to leave early. There were three kids, two boys and a girl. The girl was clearly the clever one among them and we managed to communicate in very rudimentary English. It really impressed us how bright she was and we had a really lovely evening together. The mum taught us how to make Plov, I taught the daughter how to knit and Astrid played chess with the boys. When the father came home we all ate dinner together and then the kids, mum and us all slept together in the family room. A perfect last night in Uzbekistan. 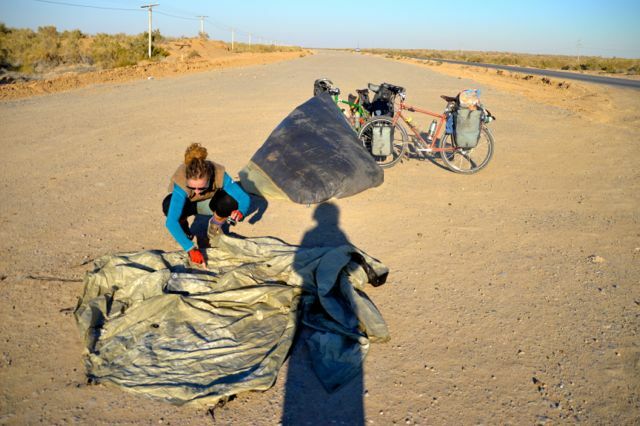 We woke early, said our goodbyes to the mum and daughter who were the only ones up, and pedalled towards the Turkmenistan border. 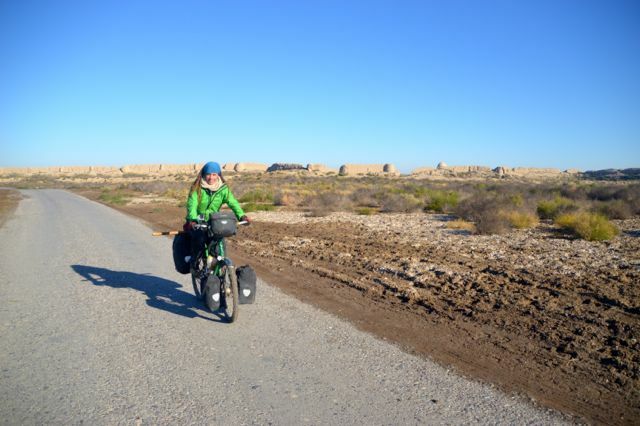 Turkmenistan is an obscure country that almost every Asia to Europe cyclist must eventually face. It is rated second last after North Korea for journalistic freedom and once had a leader who banned listening to radio’s in cars and erected hundreds of gold monuments of himself (how unusual for a dictator). 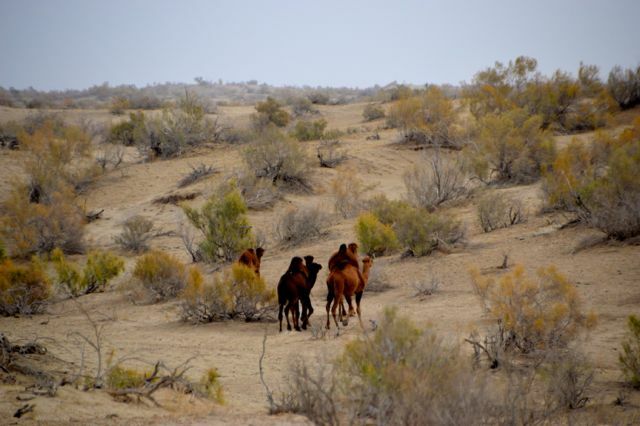 In the past, the Turkmen people were nomads who roamed the deserts of Central Asia with their animals, often capturing unsuspecting Russians on the edges of their Imperial Empire. 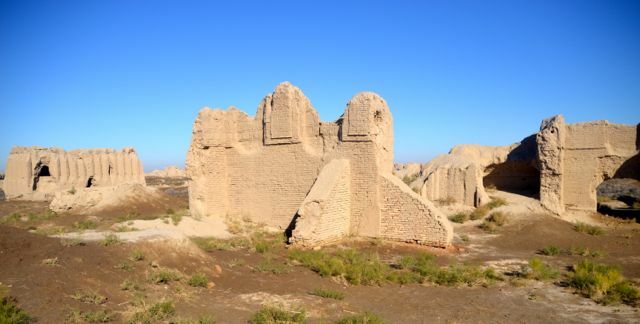 These Russians were then sold on to the Khantes of Khiva and Bukhara to live out their days as slaves. 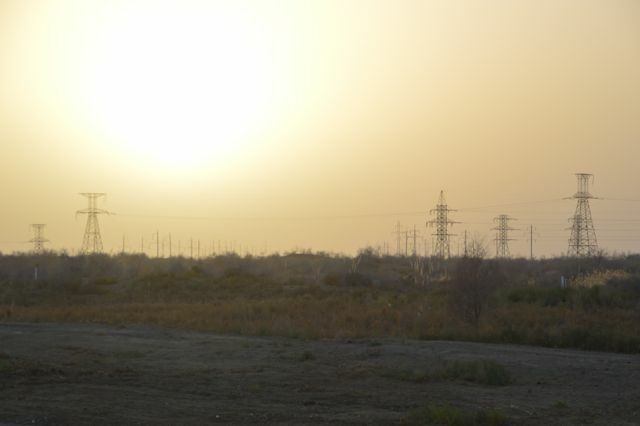 The future of Turkmenistan lies in huge gas reserves. Now that the gold statue loving leader is no longer around, perhaps some of the resources will eventually find themselves into the people’s hands. 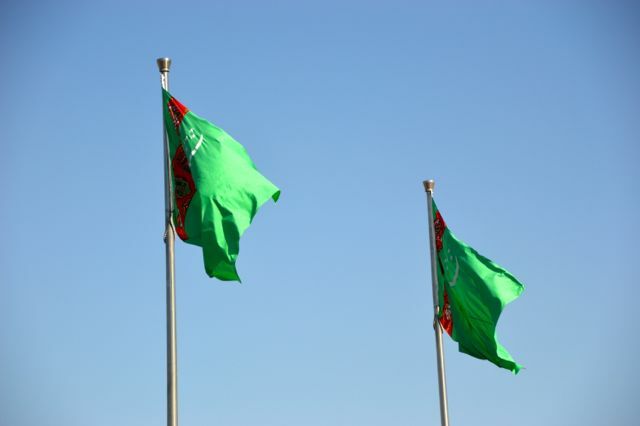 It is said Turkmenistan should be as wealthy as Dubai. Anyway, for us Turkmenistan meant ‘transit visa’. A tourist visa is only granted with a guide for a phenomenal amount of money. Being from a non-Ebola country we were granted a 5 day transit visa in Dushanbe. For any cyclists reading we applied at the embassy and they emailed us a code (yep, it actually worked!) after a week which we presented at the border. These visas are date specific so one needs to be super organised. 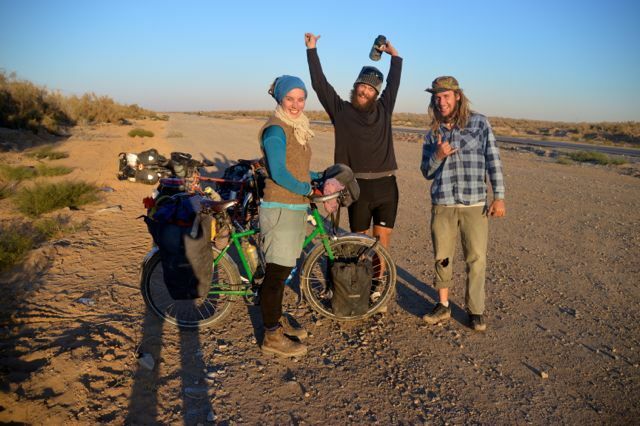 We had picked the border closest to Bukhara and had roughly 480km to cycle in 5 days. That should have been pretty simple. Unfortunately it didn’t quite work out that way. 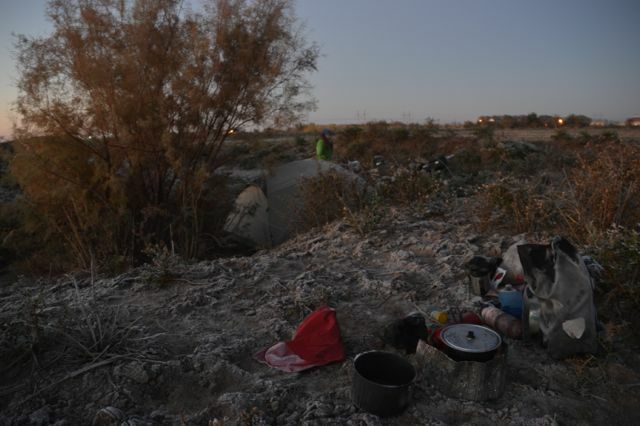 We reached the border in good time that first day and were ushered quickly though on the Uzbek side. Aside from stealing some of our Nurofen, the procedure at the Uzbek border went smoothly. They even had a working x-ray machine this time. The Turkmen border was not open when we arrived (it opens at 9am) so we watched ladies organise their piles of hideously patterned clothes to bring into Turkmenistan. Guess the fashion doesn’t get any better. 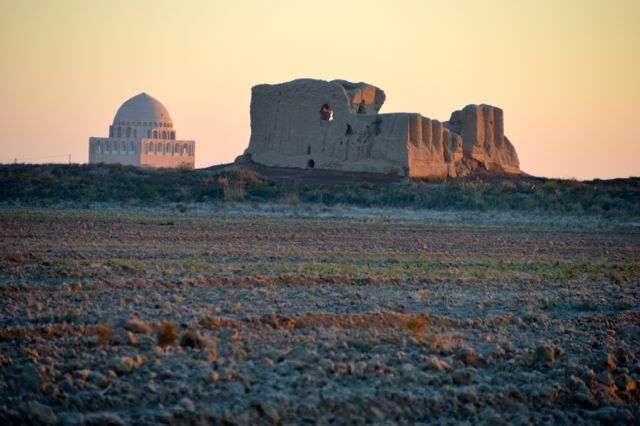 Once the border opened we paid for our visa, someone helped us with some forms, there was a half hearted search of our bags, followed by some oohing and ahh-ing over Martha and then we were inside the most obscure country in Central Asia. As we had not had breakfast, we pedalled a few kilometres before sitting under some beautiful autumn trees and cooking our porridge. It was already late when we arrived (borders often take ages) and by the time we left it was a bit after midday. People were friendly and about an hour later we were invited for chay by the side of the road by some cotton workers. 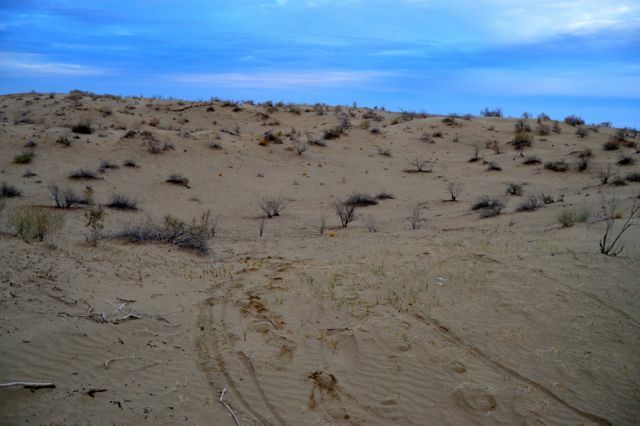 Like it’s Uzbek neighbor, Turkmenistan also contributes to the Aral Sea disaster by producing cotton in a dessert climate. Go figure. 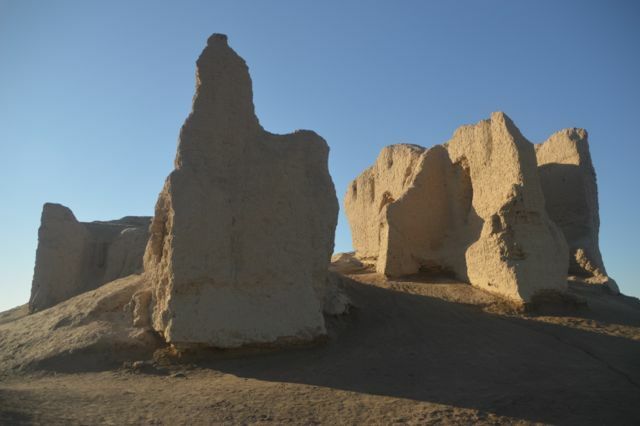 By the afternoon we reached Turkmenabat, the second largest city. We were greeted by loads of shiny buildings, statues and even a practicing parade (which we unfortunately couldn’t take a photo of as it is forbidden and the police are everywhere). Instead we stopped and looked confused until someone helped us exchange our US dollars for Turkmen Manet. I have found looking confused usually results in someone with a little bit of English stopping and assisting. It really is awesome how helpful people are. Anyway, once we had money we cycled to the outskirts of town and decided to have an early dinner, so we could continue to cycle until dark. Sadly our dinner was somewhat of a fail, pretty common for a new country. Although the cuisine is pretty similar to the rest of Central Asia, things have slightly different names. We were served a soup of doom, full of gross looking fat. The stray cats hanging around got most of it, and even they didn’t seem particularly impressed by it. We pushed on after our soup fail until nearly dark and made camp in some sand dunes. The next morning we woke to grey skies and a fierce wind. Sadly it wasn’t the fierce tailwind other cyclists had predicted we would encounter. It was at least a cross/tail but man was it cold. 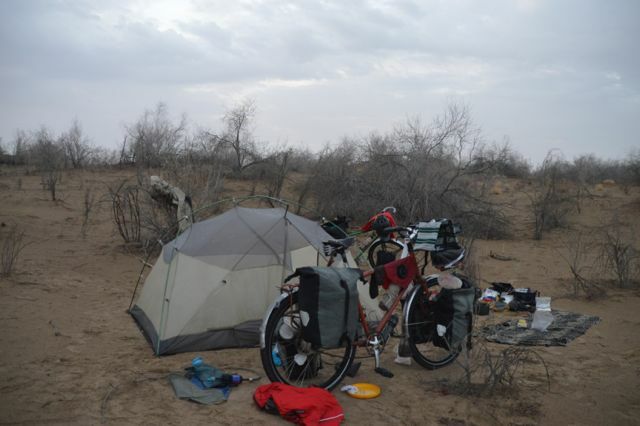 There was no time to waste so we knuckled down and cycled through the flat desert landscape, bracing the icy wind. 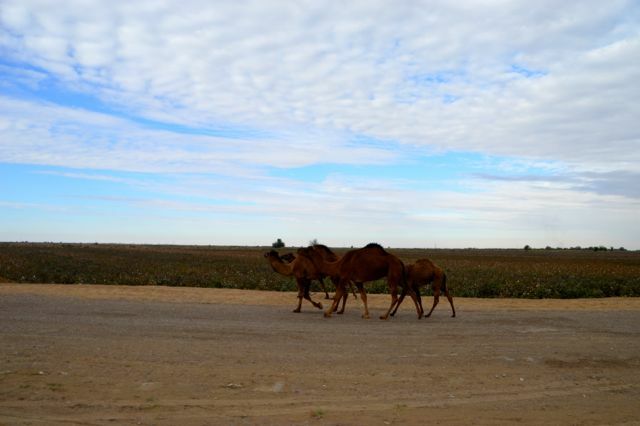 The highlight that day was seeing a herd of wild camels. We ate lunch at a lonesome truck stop, a momentary shelter from the cold. It was a bleak day, we cycled until dark and just as it began to rain we crawled behind a sand dune, finding some shelter from the wind. Overnight almost all our water froze. It was bitterly cold and we struggled to perform our morning tasks in the icy wind. 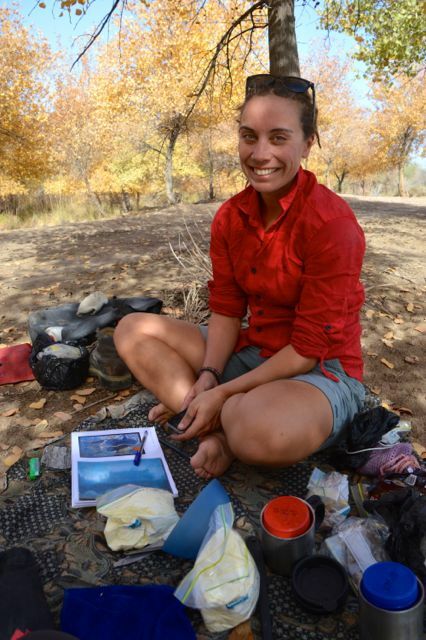 The day was cold and long, we ate at another truck stop and pushed steadily southwards. To our delight, the weather did improve and blue skies greeted us in the afternoon. 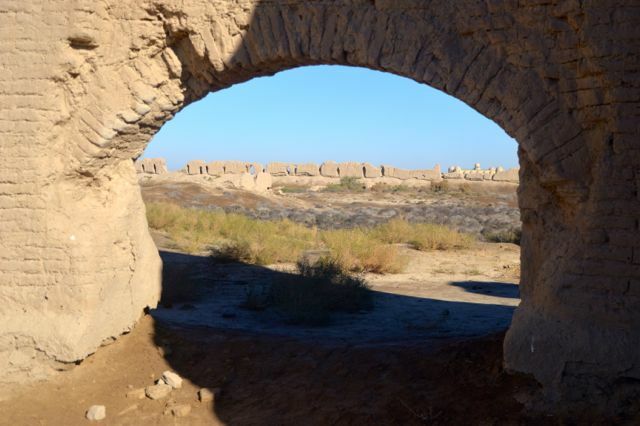 The one site in Turkmenistan we had time to visit was Merv, a UNESCO listed oasis city dating back to the 6th Century. 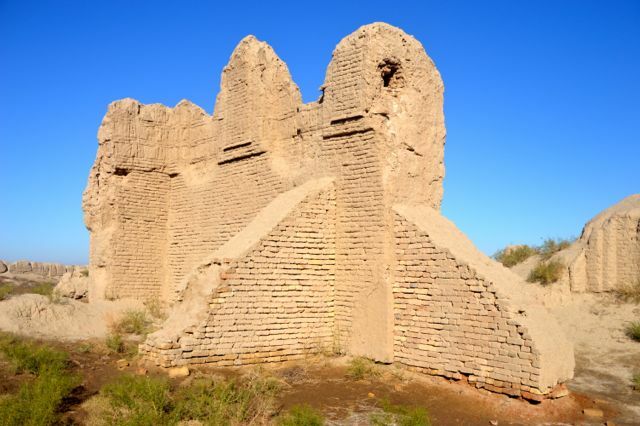 We arrived at sunset and set up our camp on the edge of some farmland, overlooking the ruins of Merv. A truly beautiful spot. In the morning we packed up and explored Merv in the early sunlight. Afterwards we pedalled hard towards Mary, which was an amazingly bizarre place, full of gold, extravagant buildings and monuments. We ate lunch there and then pushed on, making good time. I was so focused on making the kilometres that I almost didn’t hear when two cyclists shouted at me from the other side of the road. 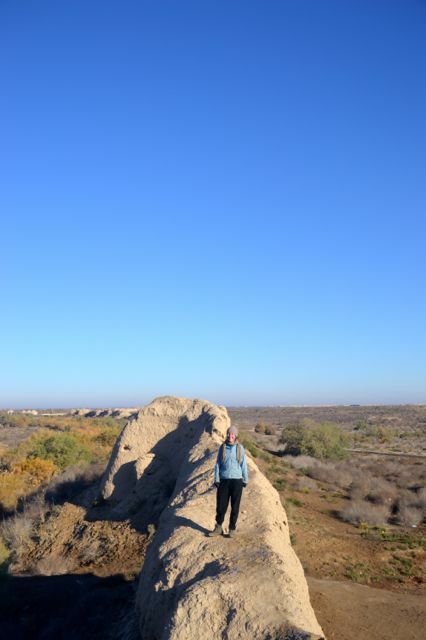 What are the chances of meeting two guys from Adelaide in the Turkmenistan desert? Not high I would have thought, but that’s where these two were from. We had a quick chat, they had cycled from Germany and were going back home. If this had been anywhere but a country that required a stupid transit visa we would have made camp together. This however was not possible, as we were all racing to opposite borders. Astrid and I pushed on until after dark, making camp on the edge of someone’s field. 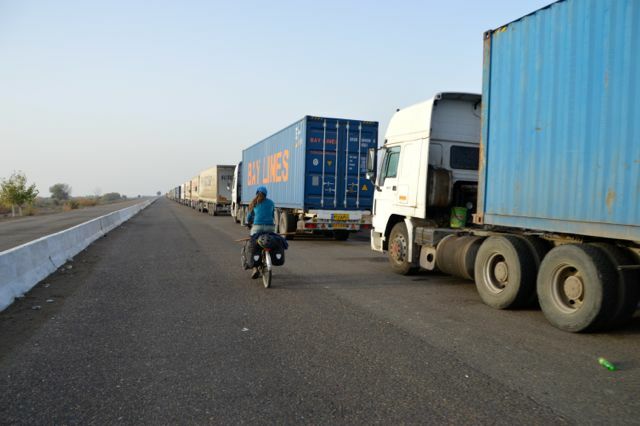 We woke confident of making the border in time. A second breakfast was had at the turn off and we spent the last of our Manet. For anyone cycling this, turn left just after the bridge (google maps is slightly off). This is the road that will take you to Saraks. 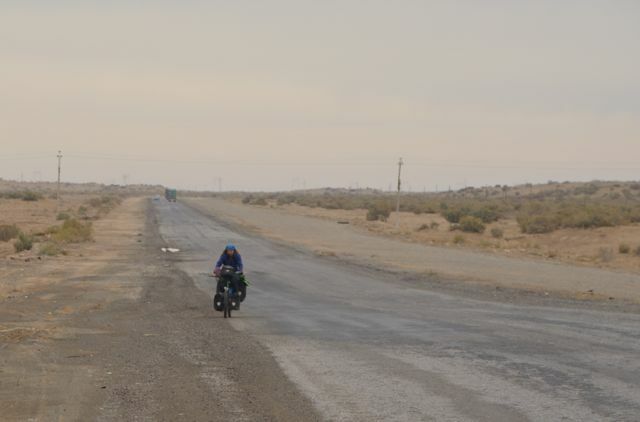 Many people had told us how bad the roads were in Turkmenistan. This was not true for us becuse of the route we took. 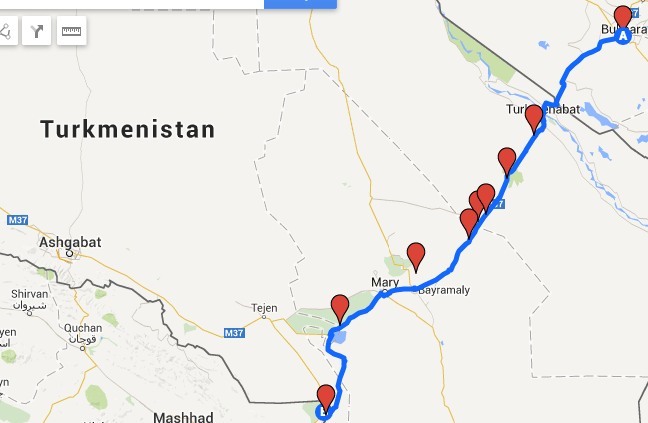 We cycled the shortest route between Faraks and Saraks and the road is fine. Once you turn left, the last 80km is a lot rougher and you will find yourself sometimes pedalling along dirt tracks next to the road. However, if like us you have been through Kyrgyzstan and the Wakhan Valley in Tajikistan, this road is not so bad at all. 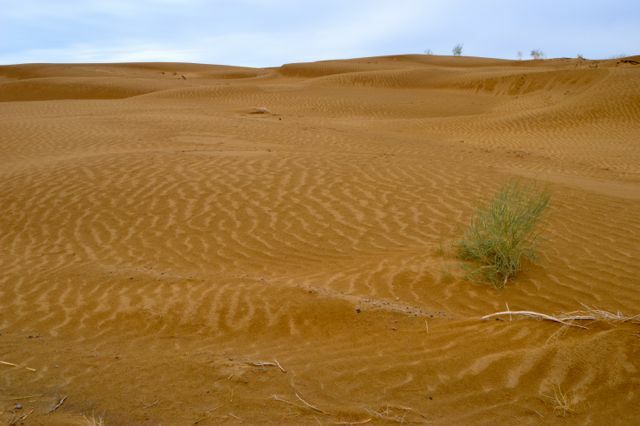 This was probably the most picturesque part of the journey and we really wished we didn’t have to rush but could have made camp in the sand dunes. 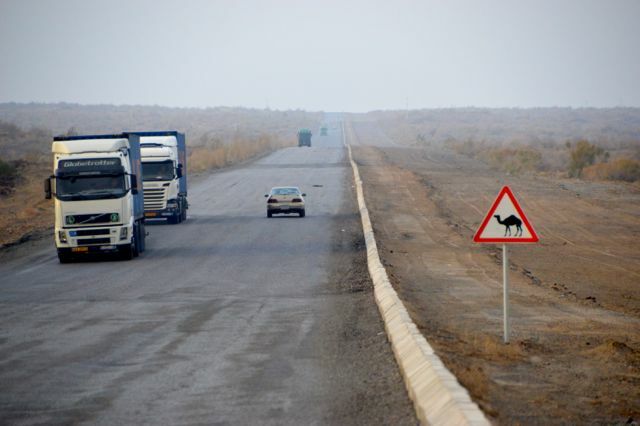 On a random road in Turkmenistan, two guys from Adelaide! Just prior to 5pm we made it to the border town of Saraks. We could see Iran! Our information stated that the border shut at 6pm and we pushed on through the town to make sure we made it. A note to cyclists – as you pedal out of town, parallel with the train line don’t bother going all the way around like the cars need to. Make sure you clear the station area, then turn left down a side street and push your bike over the track. This will save you a couple of kilomtres. Full of excitement we pedaled up to the border complex, ready to see what Iran had in store for us. Apparently the border had shut. Arguing with the guards did not help. Fuming, we turned away and stomped off to find somewhere to camp. Another note to cyclists – this border shuts at 4pm to outgoing traffic. Apparently if you arrive late you can cycle back into town and get an ‘exit stamp’ which will avoid deportation. Unfortunately no one was able to tell us this at the time. 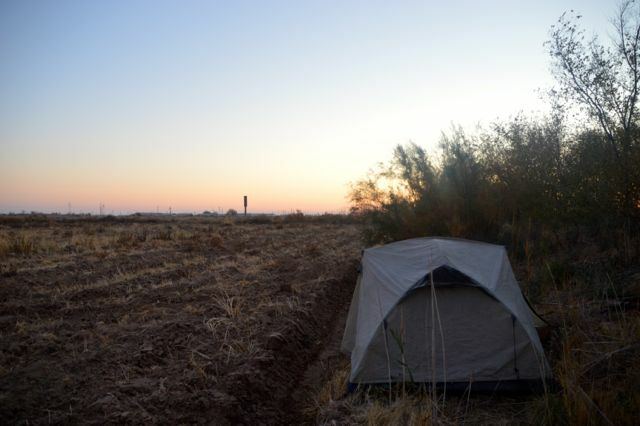 Looking around the wasteland that was this border complex, we wondered where we would put our tent. Luckily a kind man came to our aid and gave us a room that would be an office in the new border area that was being built. This was luxury for us. We made a cup of tea and considered our situation. Neither of us was particularly worried. 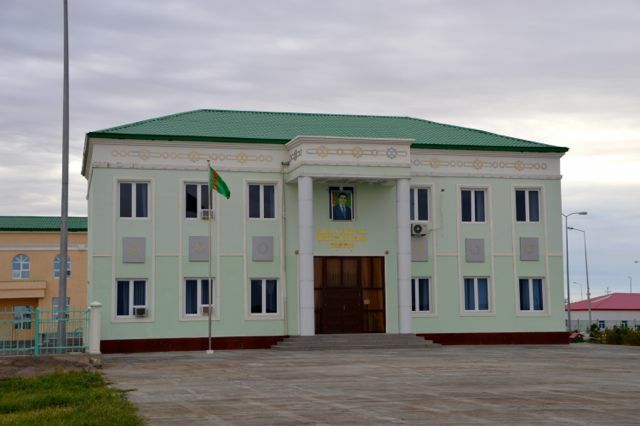 Cyclists get deported from Turkmenistan all the time. In the dark, so that no one could see into our all glass windows room we carefully stashed our US dollars (no ATM’s for us in Iran) inside our bikes (handle bars and seat post) to avoid any potential bribes the following day. After that we watched a mocumentary about Dog Shows. A random way to spend our last night in Central Asia. 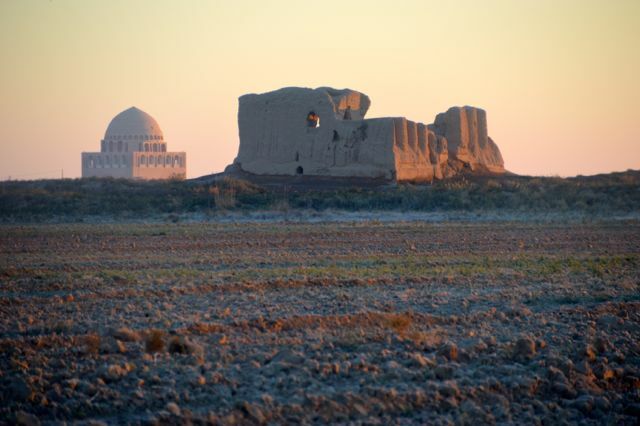 The following morning it took the Turkmen authorities 5 hours to deport us. Would have been easier for them just to let us through the night before. Most of the time I read War and Peace but occasionally we were made to sign things, have our fingers photographed and look apologetic. Right at the end we had to write a statement, explaining why we had overstayed. No one really seemed to get the cycling thing or how we could possibly not have known when the border shuts. It seems the more obscure a country is, the more they think they are the centre of the world. 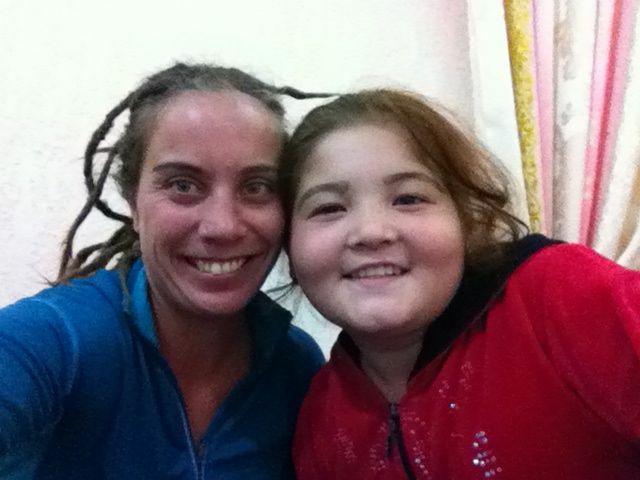 Then we had the option of paying $50 each or being deported and not permitted back into Turkmenistan for 3 years. As tragic as not being permitted back was, we opted for deportation. 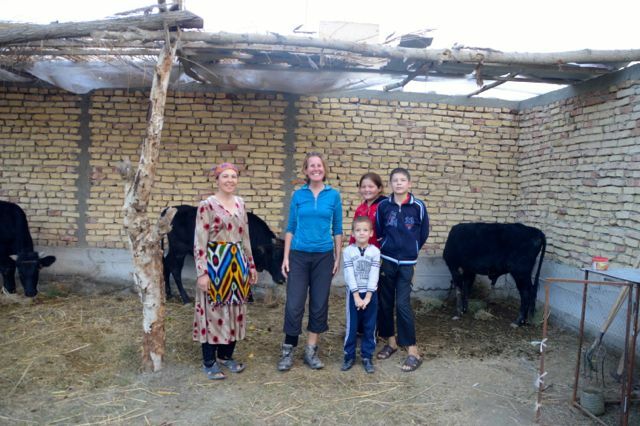 They seemed to buy our story about having no cash and family meeting us in Mashad. Finally after much pointless paperwork we were officially deported, given some food and waved into no mans land towards Iran. And there ends our adventures in Central Asia. We made sure our Islamic attire was properly in place and pedalled towards the Middle East.